A young girl in Kaduna state, Nigeria, carries water from a river known to be infested with flies that cause river blindness. “In the regions today, no country is alone. 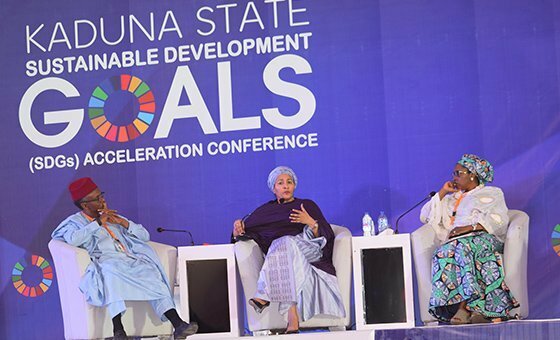 Our borders don’t make any difference in the Sahel when we talk about issues of terrorism, migration, and climate change”, Ms. Mohammed said on Tuesday at the opening of the Kaduna State Sustainable Development Goals (SDGs) Acceleration Conference 2019. “No country, no region can tackle the global challenges of today”, she spelled out. Under the theme "Building effective partnership for accelerated progress towards the Sustainable Development Goals", the two-day conference aims to fortify partnerships to fast-track implementation of the global goals, which each country is adapting to reach ambitious targets on poverty and hunger eradication, among other challenges. Ms. Mohammed advocated strongly for gender parity saying that “part of our population, especially women and girls, has to be put at the centre of the results” and not only “at the centre of our policies”. 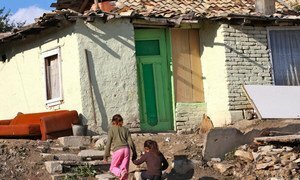 Despite a global decline in the number of people living in poverty, the Deputy Secretary-General observed that there are many reasons why extreme poverty remains. She singled out the two explanations of “when there is no enabling environment and when there is no stability”. Ms. Mohammed stressed the importance of using a national outlook, within a regional context, to drive what are global goals. The Deputy Secretary-General also argued that effective partnerships are vital to achieving the SDGs. As a case in point she focused on the room, where federal and state governments, members of the international community, civil society, and local and community authorities, were all participants. Also speaking at the conference, Governor Mallam Nasir Ahmad el-Rufai said that Kaduna state stood out as an SDG pacesetter. He noted that his administration has adopted the targets and indicators, and developed an integrated, sustainable infrastructure that would make Kaduna a leading investment destination in Nigeria and provide it with a “comparative advantage’’ to make it globally competitive. Many countries are failing to protect and promote the interests of all their people – despite pledging to do so in 2016 – the UN’s High Commissioner for Human Rights said on Wednesday.